On this Niagara Falls day trip from New York by private plane, you’ll enjoy all possible comforts. Niagara Falls is relatively close to New York. Book this tour if you would like to visit Niagara Falls on an organised tour. This tour is available from May through October. Your day starts at 05:45 at Times Square, with a luxury coach waiting for you to take you to Long Island airport within an hour. Your flight departs from Long Island MacArthur Airport. The coach drops you off right in front of the plane, so no hassle with customs and endless checks at the airport. 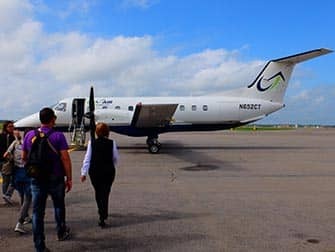 With a maximum of 30 other people you’ll board the plane, for a smooth private flight over the state of New York. During the flight, you’ll be served an authentic New York breakfast by your stewardess, who will also join you for your return flight. 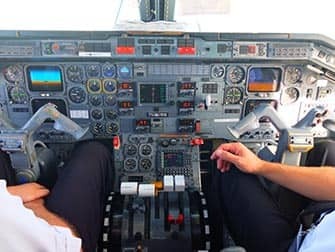 You might get the chance to have a look in the cockpit, for a chat with the pilots and a couple of photos. The pilots will also ask for permission to fly over the falls. If you’re lucky, you’ll be able to see the waterfalls from above, before you land at Niagara Falls Airport. The moment you hop off the plane, a bus will be waiting for you, to drive you in about fifteen minutes to your final destination: Niagara Falls. Eric’s Tip: Go to the toilet before you hop on the bus at Times Square. There is no toilet aboard the bus and the airplane’s toilet is small, so not very comfortable. American or Canadian side of Niagara Falls? If you book this tour, you need to choose whether you visit either the American or Canadian side. If you choose the American side, you have more time to look around, because you won’t have to go through Canadian customs. At the Canadian side, you’ll have a better view of the falls though, and that’s why I personally chose this option. Before leaving the bus, you’ll receive a voucher for all attractions included in your tour. You can then explore the area on your own, you won’t be accompanied by a guide. Are your looking for a fully guided tour? Have a look here to see if this day trip is something for you. On the Canadian side you’ll have four to five hours to see everything. If you don’t want to hurry too much, I recommend to choose two or three attractions and not to do all four of them. 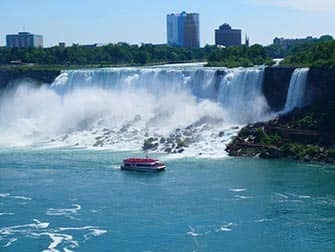 I would definitely take the Hornblower Niagara Cruise and Journey Behind the Falls and leave the Niagara’s Fury and White Water Walk as optionals. At the American side you’ll have an hour more and you can do all four attractions. On this side the attractions are: ‘Maid of the Mist’-boat tour, Aquarium of Niagara, Cave of the Winds and Niagara Adventure Theater. 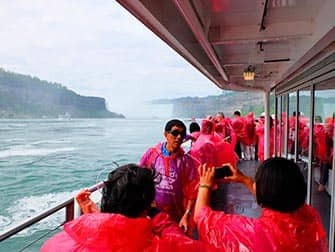 (The Hornblower Niagara Cruise and Maid of the Mist both are the same boat tours, only they depart from different sides). After you’ve admired the waterfalls for a couple of hours, the bus will pick you up again to take you to the airport. You’ll fly back to New York and travel from there back to Manhattan, where you’ll arrive around 20:00 at Times Square, point of departure. 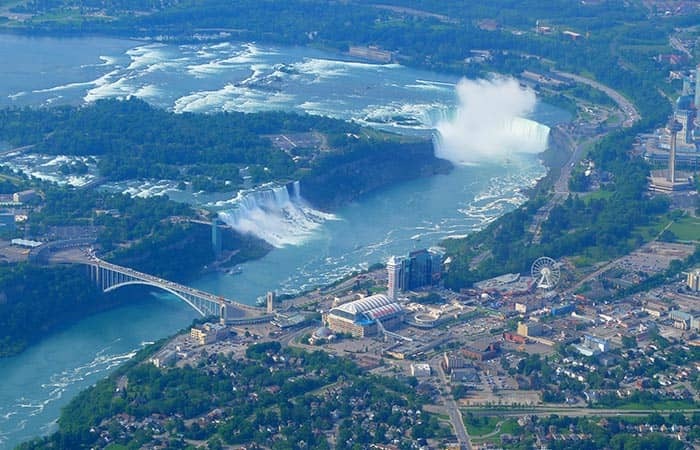 Erics Tip: There is another New York to Niagara Falls by Plane Day Trip as well. The biggest difference between the two tours is that this daytrip with a private plane is a bit more exclusive than the other one. You fly with a small plane, get a real New York breakfast, don’t have to go through customs and land at the airport near the falls. The other tour is less luxurious, but it is a fully guided tour including the visit at the falls. Note! Before you go on this tour, it’s important to make sure you have the correct documentation to enter Canada. Do you have a Australian passport? Then there is no need to apply for a visa. Since you’ll be landing on the American side of the border and a bus will take you to the Canadian side, you’re not required to obtain an eTA for Canada. When booking, due to TSA policies, all passengers must provide passport name, number and expiration date, date of birth as well as contact details for residence at the New York hotel. Unfortunately this tour is no longer available. 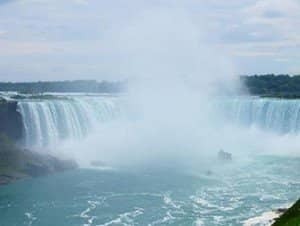 Alternatively you can book this New York to Niagara Falls by Plane Day Trip. 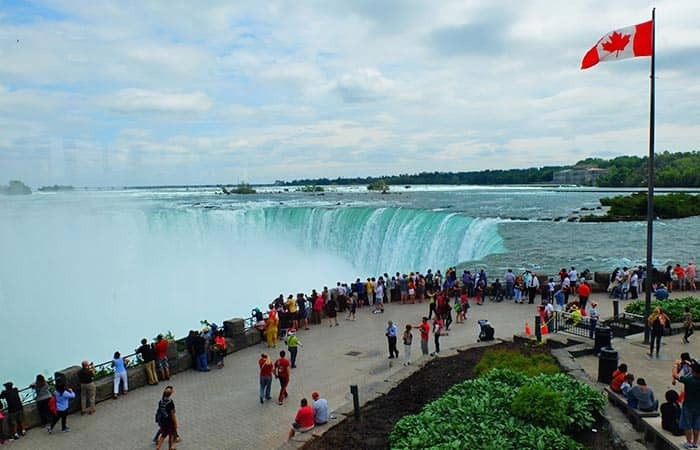 Or take this New York to Niagara Falls 2-day Trip by bus.